We stock components to replace the stock battery from 2004-2009 prius with a light hi-tech lithium manganese battery pack. Making it a PHEV with an EV range maximum 100km at ideal conditions.At least 5 prototypes are built and proceed cost and functionality improvements. OrionBMS is a full featured BMS for Lithium-ion but is well capable for several chemistries up to 5VDC. It has a fully programmable CAN bus and is able to communicate in CAN networks as wel working with the OBD2 diagnostic standard. 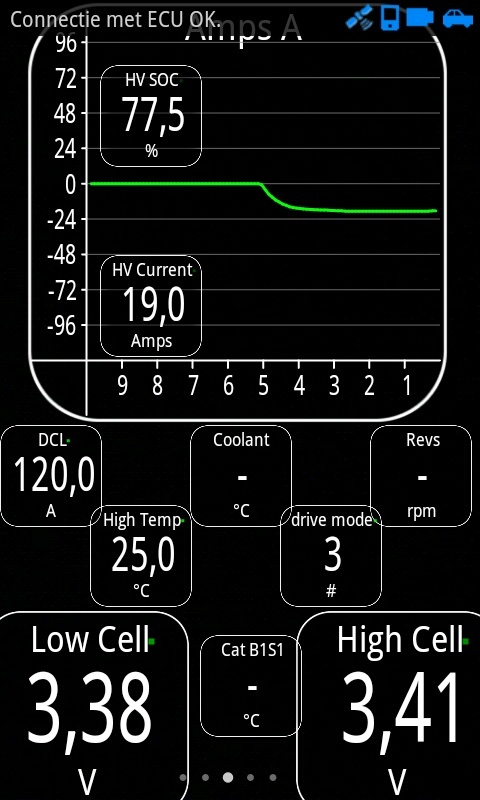 this screenshot represents a wireless dashboard, using an Andoid based mobile device and a third party application called "Torque". this application is used in our Prius PHEV conversions to inform the driver about battery conditions as well as standard vehicle information trough a OBD Bleutooth adapter. functions as faultcode reading and erasing/ this app is also fully programmable and can be used in combination with OrionBMS. Have a look at this link and see the actual results for a Prius PHEV conversion in fuel economy composed by a satisfied customer. We also offer Hymotion L5 PHEV conversions for competitive pricing. we have used and new battery packs. Check out our SHOP for EV components!